Heat oven to 350°F. 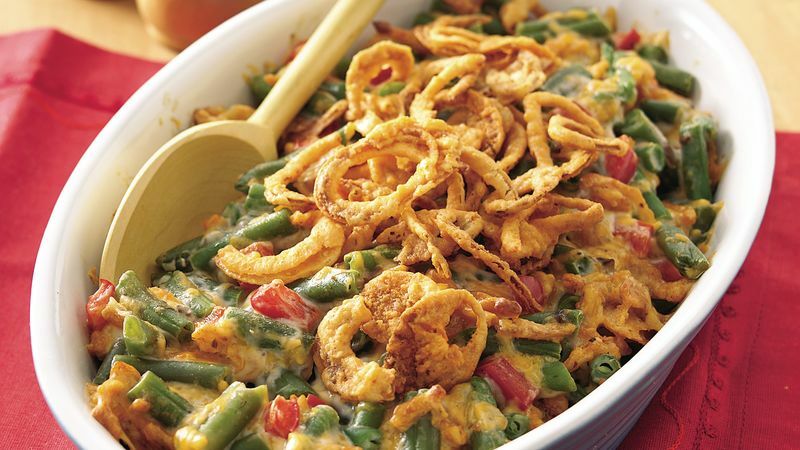 In 1 1/2-quart casserole, stir together soup, cheese blend and soy sauce. Stir in green beans, bell pepper and 1 cup of the onions. Cover; bake about 30 minutes or until beans are tender and mixture is heated through. Stir; top with remaining 1/2 cup onions. Bake uncovered about 5 minutes longer or until onions are brown and crisp. Instead of the red bell pepper, drain a small jar of diced pimientos and stir them into the bean mixture.